On September 8, 2015, Pope Francis issued a moto propio— a new law governing Marriage Cases Processes, with substantive changes to the process for obtaining a declaration of nullity, called an annulment. The Code of Canon Law of 1983 incorporated the Church position and since that time, the process for providing justice to these people has been instituted and improved. The reform of canonical processes for the declaration of nullity of marriage, in the Code of Canon Law (CIC) and the Code of Canons of the Eastern law is presented in two documents, Mitis Iudex Dominus Iesus, for the Latin Church and Mitis et misericors Iesus, for the Eastern Rite Churches. The new law went into effect December 8, 2015 the start of Pope Francis’ Holy Year of Mercy. The Holy Year of Mercy, was a year-long jubilee during which the Pope emphasized the merciful side of the church and directed us to simplify strict and rigid rules and practices regarding annulments in order to bring us more meaningfully into the Church. With over 6 million divorced Catholics in the United States, this represents a searing experience of personal tragedy for these 6 million people. Many are wounded further by feeling cut off from the Church when they so desperately need her. The Church has new insights into interpersonal relationships which may affect the validity of a marriage which appears by all outward signs to be valid, even by the parties. Under the new rules it is be easier for the Seattle Tribunal to accept a marriage case when the wedding took place outside the United States or a person’s former spouse is currently living outside the United States. If the tribunal gives an affirmative decision and no one challenges it, both parties can enter a new marriage in the Catholic Church. Pope Francis encourages tribunals to make the marriage nullity process accessible to all. Some who petition for a declaration of nullity will qualify for the new shorter process introduced by the Holy Father if evidence for the invalidity of the marriage is strong and not disputed. For cases that qualify and when both parties to the marriage consent to the shorter process, the Tribunal will do an investigation and the bishop will make a decision in a time shorter than the ordinary process. The preliminary gathering of testimony and documents will occur in the parish with the assistance of a tribunal advocate for all types of cases. Will the new laws benefit me? Are you divorced from a previous spouse and living in a new marriage not celebrated in the Catholic Church? Now is a good time to ask about petitioning for a declaration of nullity in order to have your new marriage recognized by the Catholic Church. 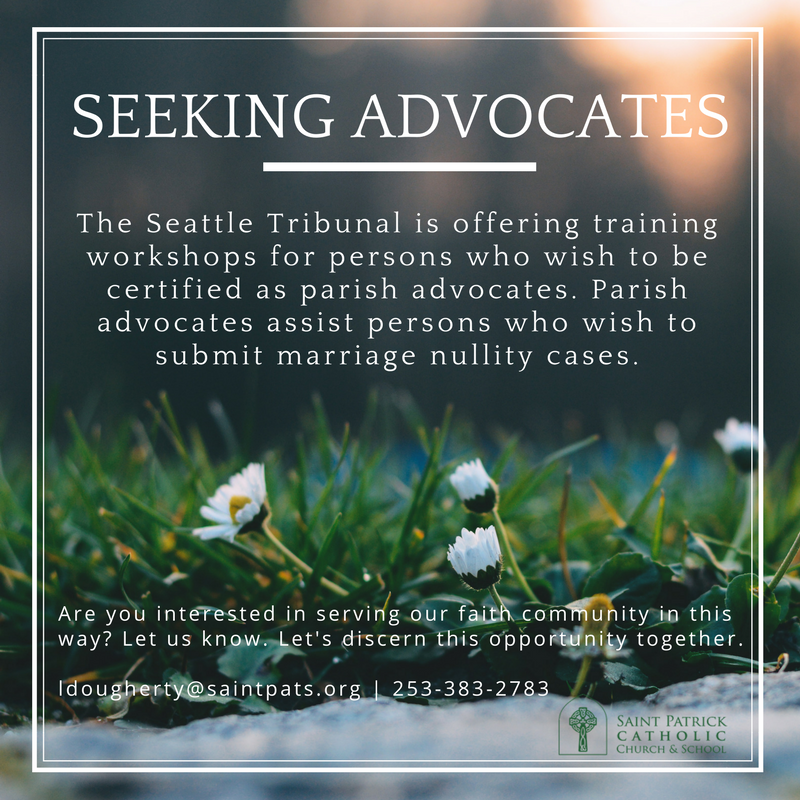 Most of the parishes in the Archdiocese of Seattle have women and men trained to assist you in presenting a petition to the Tribunal. Saint Patrick Catholic Church has several tribunal advocates to help begin the process. What Does a Tribunal Advocate Do? The Northwest Catholic article posted on Facebook page describes the role of a tribunal advocate. Do you know what a tribunal advocate does? If you believe that you have grounds for invalidity or dissolution of your marriage under the laws of the Roman Catholic Church, your first point of contact should be your local parish. The Tribunal Advocates are ready to discuss or meet with you at a convenient time and place. We encourage you to make an appointment with a tribunal advocate— a person who is trained and delegated to assist with the preparation of marriage cases— whether your are asking for yourself or someone you are concerned about. The advocate will listen, help clarify the key issues, determine what type of case you have, and assist with procedural and jurisdiction questions. Let us all work together to bring justice to our fellow men and women and bring them into the Sacramental fullness of the Church. The Seattle Archdiocese, the United Conference of Catholic Bishops and the National Catholic Register offer additional resources on annulments.